With all the stories about drought causing ISIS, I thought maybe a couple of technology stories on developments in nuclear power plants with a desalienation role might provide enough hope to keep Californians from beheading each other for a while. It has been announced that South Korea and Saudi Arabia have signed a Memorandum of Understanding (MOU) which includes the construction ofSMART Small Modular Reactor nuclear plants. "...SMART is an integral-type small reactor, developed in 2012 after 15 years of research. It received the first-ever Standard Design Approval (SDA) from a regulatory body for a 100MWe (330MWth) integral reactor. 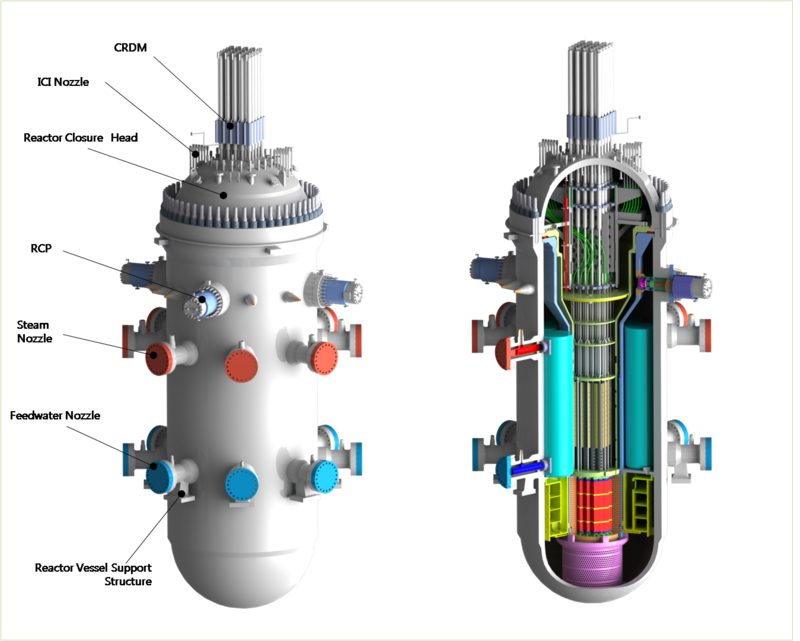 SMART generates only a 1/10 of a large nuclear plant (over 1,000 MWe), but since it is an integral-type reactor it has enhanced the inherent safety by containing major components such as a pressurizer, steam generator, and reactor coolant pumps in a single reactor pressure vessel. It was designed especially for export and can supply a city with a population of 100,000 with 90 Mw electricity and 40 thousand tons of fresh water per day concurrently. ."
...According to early reporting of the deal by Korea Herald the MOU will see a three year development program launched, which will determine feasibility of building SMART SMR nuclear plants in Saudi Arabia. ...It is beginning to appear if South Korea is "hitting on all cylinders" now when it comes to nuclear plant export. The APR1400 plants at Barakah, UAE are on time and on budget. Now, a MOU (which definitely is not an order for plants, but is definitely the first step) for the KAERI designed SMR is on the books and real, meaningful work studying the construction of power plants using this design in arid locations is about to begin. Rusatom Overseas is aiming to sell desalination facilities integrated with large capacity nuclear power plants to Russia's export markets. Dzhomart Aliyev, head of Rusatom Overseas, announced the new offer this week saying the company estimated "a significant potential in foreign markets". His words follow the 10 February agreement between Egypt and Russia to develop the design for a combined plant offering nuclear electricity as well as production of potable water through desalination. Two desalination units are also being considered for potential inclusion in Iran's plans to expand the Bushehr nuclear power plant with further Russian technology. And an agreement between Argentina and Russia also included desalination with nuclear power cooperation. While Russian and South Korea are moving forward on connecting water and energy, the U.S. Department of Energy did produce a report about it. Washington – The U.S. Department of Energy (DOE) released a new report that frames an integrated challenge and opportunity space around the water-energy nexus for DOE and its partners and lays the foundation for future efforts. Present day water and energy systems are tightly intertwined. Water is used in all phases of energy production and electricity generation. Energy is required to extract, convey, and deliver water of appropriate quality for diverse human uses. Recent developments have focused national attention on these connections. When severe drought affected more than a third of the United States in 2012, limited water availability constrained the operation of some power plants and other energy production activities. Exploit productive synergies among water and energy systems. It's kind of tough for a relative energy glutton to export efficiency.